iDevices iShower2 Bluetooth Speaker Review | Nerd Much? 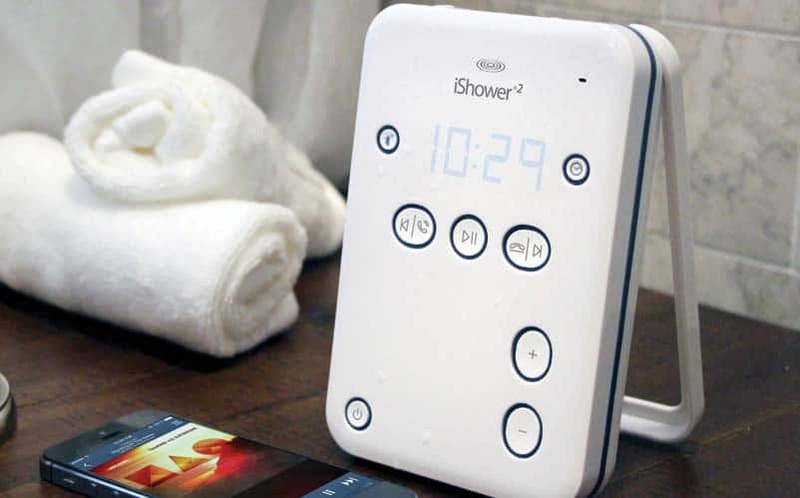 The iDevices iShower 2 is a water-resistant Bluetooth speaker (a revamp of the company’s previous iShower) allows you to bring your favorite audio entertainment right into the shower with you. Don’t let the name deceive you; it is not iPhone-specific and will pair with any smart device via bluetooth, and is compatible with all popular audio apps. Also, its 5 user profiles allow you to share with family or roommates. Pairing is more complicated than necessary but I had no issues with my Samsung Galaxy S5 once I read the included directions. I should warn you, however, that once paired it will automatically start playing through the speaker whenever you enable Bluetooth on your phone and the speaker is powered on (which startled me the first couple times, admittedly). The base mounts easily with 3M adhesive tape and seems to adhere well in the shower, but you can also remove the speaker and prop it up anywhere with the attached fold-out stand (or even hang it). It boasts an impressive 200-ft bluetooth range so your device is safe from water damage, and you can control your music with the buttons on the device. There is even a built-in speakerphone function so you can answer your calls in the shower (because that’s not awkward at all). Call quality is respectable but the microphone doesn’t block out ambient noise well – so your caller will most likely realize that you are, in fact, talking to them in the shower. Audio quality is decent, if not fantastic. The volume goes high enough to be heard over the running water (I find it to be sufficiently loud at the 7 out of 10 volume setting) without any distortion detectable at higher volumes (save maybe songs that are heavy on the bass). Not bad at all for a shower speaker. Pushing a button on the device displays an LED clock to ensure that you never lose track of time (as well as ‘hi’ and ‘bye’ when you turn it on and off). The major downside to this speaker is the lack of a charging cable. It requires 3 AA batteries (which are included), but for $100, I would have expected it to be rechargeable. It does, however, claim an average battery life of 25 hours. I’ll let you do the math as to how many showers that works out to and decide if it’s worth the hassle. On the plus side, the battery compartment is relatively easy to open and close – no tools required. All in all, the iDevices iShower 2 is a decent Bluetooth speaker for the price. There are a limited amount of Bluetooth shower speakers on the market and this seems to be one of the better ones. Check out more super cool stuff here. Buy the iDevices iShower2 Bluetooth Speaker here.